Here's a recipe from my Grandma's closet. 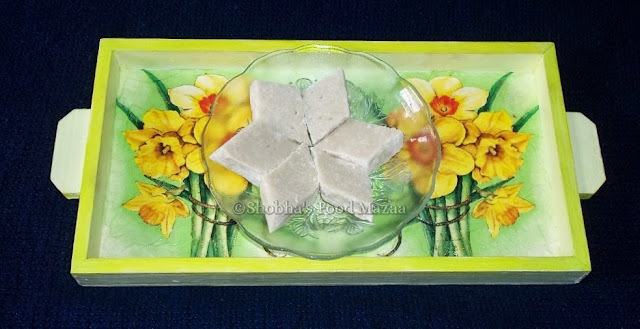 She always made this sweet along with the Gurdani every Diwali. Unlike these days our mothers and grand mothers made every thing at home during festive days. And hard as I try, I can't match her skills in this recipe. It's not as simple as it looks, as the whole trick is about timing and once you know that, (which comes only by experience), you are a master! Method: 1. Let the syrup cool completely. Keep stirring it. It becomes thinner & of flowing consistency. Now you remove it from fire to let it cool. 3. Remove from fire and let it cool until luke-warm. 4. Now, add the sugar syrup through a seive to the cooled maida (off the flame), then stir briskly until you can feel the pressure of the thickening of the maida paste. We add the sugar syrup & mix it.. (off the flame). We mix it for a long long time until the mixture thickens & we can see it hardening. Cut into cubes and... have a blast this Diwali!! 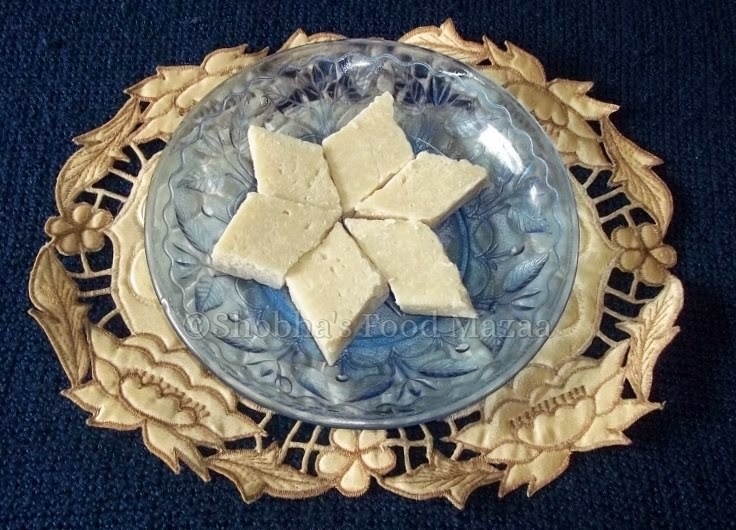 Note: This sweet is made in traditional Sindhi homes. Unfortunatey, the trend is dwindling away because of the ready availability of sweets in the market. But the joy of making and sharing home-made sweets with friends and relative during festivals can not be matched with anything. Grandma's sweets are definitely special, looks very yummy. Yes you are right.The key ingredient that goes into their dishes is LOVE ! Very true Aipi .. all the recipes of moms and grandmas are unbeatable,though made with simple basic ingredients. Bookmark event is really a novel idea and I will be glad to send in my recipes. oh, thanks for sharing. i love this post. please keep posting and God bless! Your blog is very enriched. You can see my website Inhyderabadmall which provides Diwali Sweets to Hyderabad, Diwali Puja Hampers to Hyderabad,Hyderabad,India. delicious recipe dear with illaborative steps !!!! wishing u n ur family a very happy diwali !keep rocking ! jus saw dis recipe, shobha..thanx, was planning to ask masi about it.. 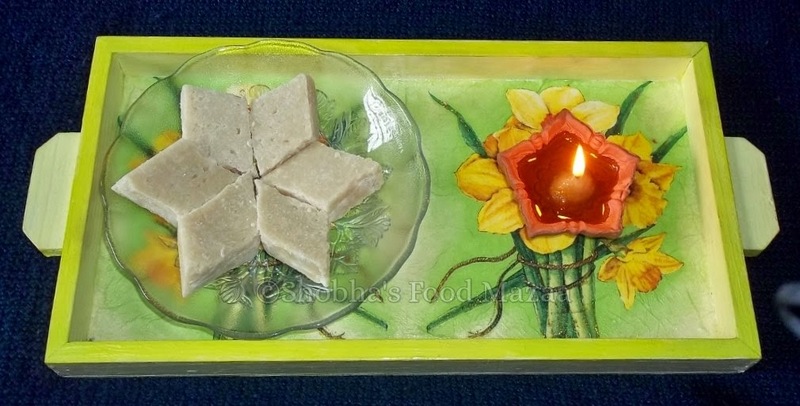 Thanks Shobha for linking this irresistible Sweet recipe to the event and Love the way you presented. wish u a very happy new year too shobha & the sweet looks great.. true the consistency is so imp & our grand mom & mom are def experts..thanks a bunch for linking! Thanks Rasi.. wish you also a vary happy new year.